Port and Koules Fortress - View of the port and the Venetian castle (Goulas) of Heraklion. Triopetra (Crete): Paximadi Islands, 36.6 mi. Rethymno (Crete): Two Views, 37.3 mi. Chora Sfakion (Crete): Chora Sfakion Port, 57.2 mi. Chania (Crete): Panorama over Chania, 63.8 mi. Chania (Crete): Old Port, 63.9 mi. Chania (Crete): Livestream Old Port of Chania, 64.1 mi. Santorin: Voreina Gallery Suites, 74.1 mi. Santorin: The view of the Santorini Volcano, 76.2 mi. 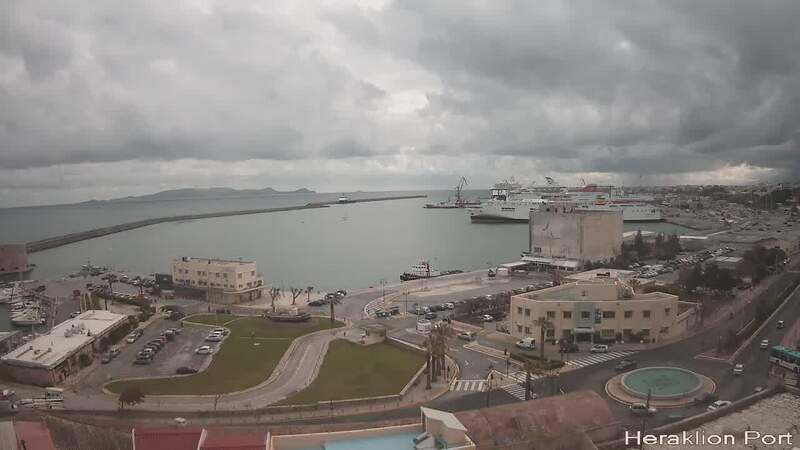 This webcam Heraklion (Crete) with the theme Harbors was added on June 2, 2014 and is operated by Port Heraklion. It got 15749 visitors since then. Shouldn't this webcam work or should the link be wrong please report that here. You can add this webcam here to myCams.